The Spyderco Salt 2 combines all the salient features of the best-in-class Delica 4 Lightweight model with the extraordinary corrosion resistance of H-1 steel. These include enhanced ergonomics, a high-traction Bi-Directional Texturing pattern on the handle, and a black-coated titanium pocket clip that supports left or right-side, tip-up or tip-down carry. Unlike the Delica 4, which uses stainless steel liners in the handle, the Salt 2's handle components are molded from solid fiberglass-reinforced nylon (FRN) and fitted with four sets of threaded stainless-steel inserts to mount the four-position clip. 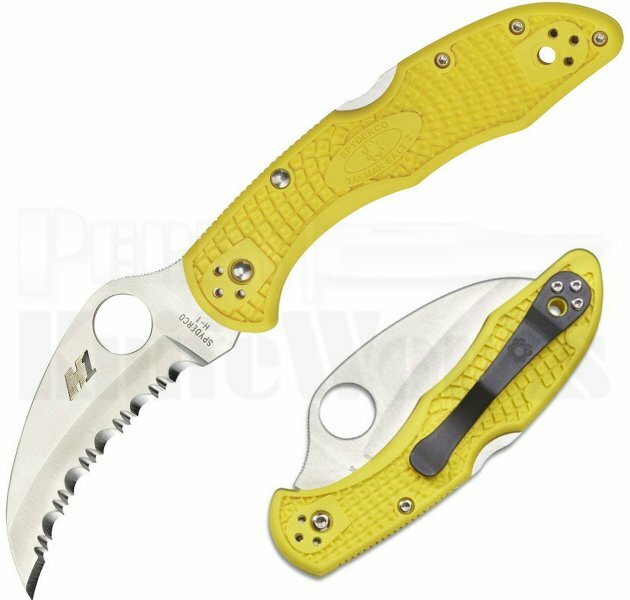 This Tasman Salt 2 knife has a yellow FRN handle and a rustproof H-1 steel blade with a fully serrated cutting edge.